ERBIL, Iraq, 15 September 2013 — It’s exactly one month since the government in Iraqi Kurdistan reopened its borders to accept refugees fleeing conflict in Syria. 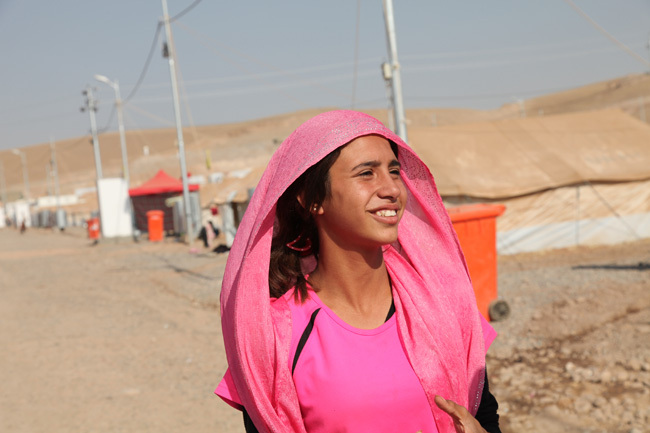 They now live in a small tent in the Kawergosk refugee camp, due west of the regional capital, Erbil. Becoming accustomed to their new conditions has been hard, upheaval compounded by the fact that their oldest brother was killed in the conflict. For Adla and her brothers and sisters, grieving and disoriented, time weighs heavy. The children’s main chore is collecting water, a task that involves jerry cans and several daily trips to a pump, in baking heat. The family has trouble getting enough to eat. The conversation is conducted through a translator. When he steps away for a moment to take a telephone call, Adla, her sisters and several other girls who have gathered around, immediately start plucking at their shirts. When the translator returns, he explains what they’re trying to say. The school year is due to start soon in Kawergosk and for Adla it is the key to a better present as well as a better future. “I like school very much, because I want to help my father and mother,” she says, wiping tears from her eyes. Quickly recovering her composure, Adla says her family is very grateful for the warm welcome her family has received in Iraq. And although things are hard now, she knows that they will not always be this way.